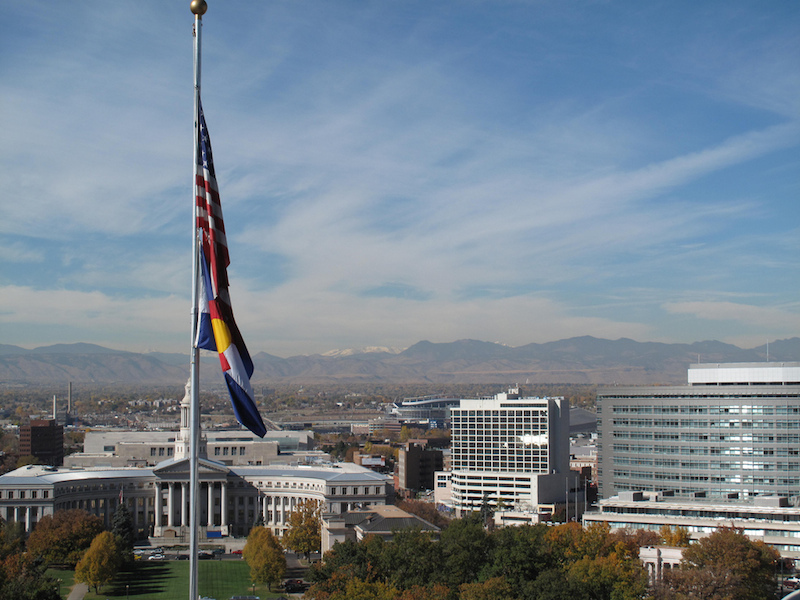 Colorado saw the fifth-highest percentage increase in population of any state between 2010 and 2013 according to data from the U.S. Census Bureau. And the state is predicting growth, particularly in northern Colorado, will continue. The economy is bustling, with the Denver metro area expected to add 39,000 jobs in the coming year. If you’re considering investing in a home here, the state has plenty of programs to help first-time homebuyers find a new home. Are homes available? We looked at the area’s homeownership rate to determine the availability of homes. A low homeownership rate is likely a signal of competitive inventory, more options for renters rather than buyers and expensive housing. Areas with a high homeownership rate led to a higher overall score. Can you afford to live there? We looked at median monthly household income, monthly homeowner costs and median home value to assess affordability and determine whether residents could live comfortably in the area. We used monthly homeowner costs to measure cost of living. Areas with high median incomes and low cost of living scored higher. Thinking of buying a home yourself? Check out our mortgage tool to find the best rate. Is the area growing? We measured population growth to ensure that the area is attracting new residents and showing signs of solid growth. This is likely a signal of a robust local economy, which is another attractive characteristic for homebuyers. For more details on our methodology, please see the end of this article. Located in Weld County, Firestone saw the highest population increase on NerdWallet’s list with a jump of 13.5% between 2010 and 2012. The median household income is $6,832 per month and 27.5% of that income is devoted to homeowner costs. The median home value in Firestone is $242,700, and 88.8% of homes are owned rather than rented. Firestone is home to various parks and trails, including Harney Park and Firestone Trail, as well as a regional sports complex. A part of Boulder and Weld Counties, Erie has a homeownership rate of 84.5%. This town saw the second-largest population increase of any place on our list with a population increase of by 11.2% between 2010 and 2012. The median monthly household income is $8,937, and 24.3% of income is devoted to homeowner costs. The median home value is $334,200. Erie is only about 20 minutes from Boulder, the location of University of Colorado Boulder, one of the state’s largest employers. Erie has a busy community center and it’s also known for its arts community, promoted in part by the Arts Coalition of Erie. Located in Douglas County, The Pinery has the highest median monthly household income on NerdWallet’s list. Located near our tenth city, Parker, residents of The Pinery rake in a median monthly household income of $9,430, and 26.1% of that income is spent on homeowner costs. The census-designated place saw a 9% population increase between 2010 and 2012. This place also has the highest homeownership rate and median home value in our top 10 at 93.5% and $360,900, respectively. This small community is home to The Pinery Park and Pinery Access Trail for recreation. Located in the Pueblo metro area, Pueblo West saw a 5.9% increase in population between 2010 and 2012. Residents of Pueblo West make a median monthly household income of $5,413, and 25.9% of that income is devoted to homeowner costs. The median home value is $179,300, and 81.2% of homes are owned rather than rented. Pueblo West offers classes for kids and adults, including pottery, ballet and fitness classes and many trails that take advantage of the area’s geography. Those interested in Pueblo West may want to check out the Home Down Payment Assistance Program, an affordable housing mortgage assistance program offered through the City of Pueblo that helps low to moderate income individuals and families purchase their first home within Pueblo County. In northern Colorado, Windsor’s population grew by 7.7% between 2010 and 2012. The median home value in Windsor is $258,000. The median monthly household income is $6,662 and 27.8% of that is devoted to homeowner costs. Windsor sits between the city of Greeley, home to the University of Northern Colorado, and Fort Collins, which is home to Colorado State University and the Poudre Valley Health System, a big employer for the state. The homeownership rate in the town is 79.1%. Windsor has a rich arts community, which includes an active community theater at the Windsor Playhouse, and an interesting history as a prime location for the sugar beet industry in the early 20th Century. Located in Jefferson County to the southwest of Denver, Dakota Ridge is a census-designated place where the median home value is $248,500, and 83.1% of homes are owned rather than rented. Dakota Ridge is about 20 miles from Denver, the largest city and state capital of Colorado, giving Dakota Ridge residents easy access to the state’s largest employers located in Denver, including the U.S. Government, the State of Colorado, and Denver Public Schools. The median monthly household income in Dakota Ridge is $6,740, and 26.6% of that income is devoted to homeowner costs. Dakota Ridge saw a 5.3% population increase between 2010 and 2012. Sitting 6,202 feet above sea level, Castle Rock households earn a median monthly household income of $7,065, and 29.7% of that income is devoted to homeowner costs. The town is named for a castle-shaped butte near its center. In Castle Rock, 75.5% of homes are owned rather than rented. The town saw an 8.8% population increase between 2010 and 2012. Almost half of the residents work about a half an hour away in Denver and 31% work in high-tech jobs for companies such as HP, Nextel, and Boeing, which have locations in Denver. Like many towns and cities in Colorado, Castle Rock takes advantage of its environment and has 19 developed parks and 51 miles of trails. Potential homebuyers here and in other parts of Douglas County can receive aid in buying their first home from the Douglas County Housing Partnership, which provides $15,000 in down payment assistance to qualified first-time homeowners. Located just north of downtown Denver, Commerce City has a homeownership rate of 72% and the city’s population increased by 9.7% between 2010 and 2012. The city’s median monthly household income is $5,080, and 33.3% of that income covers homeowner costs. Residents can take advantage of the city’s 25 miles of trails and award-winning golf course, as well as various recreational programs. The median home value in Commerce City is $188,400. For potential Commerce City homebuyers, Adams County Housing has a homeownership program offering down payment and closing cost assistance. Commerce City also has its own housing authority that helps residents with costs associated with down payments, buying and improving their homes. Located in Mesa County on the west side of the state near the Utah border, Fruita saw a 6.6% population increase between 2010 and 2012. The median monthly household income in this city is $5,085, and 27.1% of that income is devoted to homeowner costs. The median home value in Fruita is $220,000, and the homeownership rate is 75.7%. A part of the Grand Junction metro area, Fruita is famous for its Fruita Fall Festival, a three-day event where over 150 vendors sell their arts, crafts, and foods that draw a crowd of more than 50,000. The festival will celebrate its centennial this year. Fruita also has an arts and culture board that supports local artists. The town of Parker is located in Douglas County, about 30 minutes south of Denver, and its population expanded by 6.2% between 2010 and 2012. The median monthly household income in Parker is $7,968, and 25.7% of that goes to cover homeowner costs. Major employers in town include the Douglas County School District, Parker Adventist Hospital, and the Town of Parker. Keeping close ties to the past is a priority in Parker: the town just received a $100,275 grant from Colorado’s State Historical Fund for restoration work on the town’s historical Parker Consolidated School at the Mainstreet Center. The median home value in Parker is $286,300, and don’t forget to check out the Douglas County Housing Partnership for help buying that new home. 1. Homeownership rate made up 33.3% of the total score. A higher rate earned a higher score. The rate comes from the U.S. Census American Community Survey 5-year Estimates. 2. Selected monthly owner costs as a percentage of median household income made up 16.7% of the total score. A lower percentage earned a higher score. Monthly homeowner costs as a percentage of median household income made up one-half of the affordability score. Median household income comes from the U.S. Census American Community Survey 5-year Estimates. Monthly homeowner costs come from the U.S. Census American Community Survey 5-year Estimates. 3. Median home value made up 16.7% of the total score. A lower value earned a higher score. Median home value made up one-half of the affordability score. Median home value comes from the U.S. Census American Community Survey 5-year Estimates. 4. Population change from 2010 to 2012 made up 33.3% of the total score. A higher percent change earned a higher score. The 2010 population comes from the 2010 American Community Survey 5-Year Estimates. The 2012 population data comes from the 2012 American Community Survey 5-Year Estimates. NerdWallet calculated the percent change. 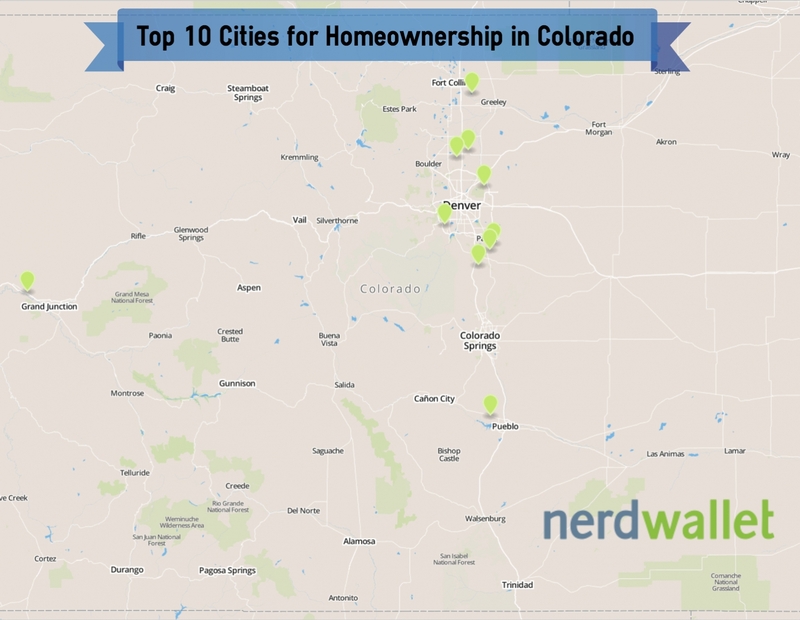 All 57 places in Colorado with more than 10,000 residents were included in this analysis. Communities with higher than average crime weren’t included in the rankings. Fort Carson and Castle Pines weren’t included because of missing data. Image courtesy of José Maria Silveira Neto via Flickr.